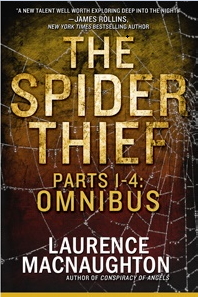 Enjoy this free excerpt from The Spider Thief! It didn’t take FBI agent Cleo Barrett long to find Prez’s office. She just followed the thin strains of old funk music back through the warehouse. Prez turned out to be a thin, middle-aged black guy in a sharp suit. He leaned over a granite counter in a little kitchenette, assembling a salad, his back to her. The stainless steel door of an expensive-looking refrigerator stood open next to him. The rest of his office looked like a luxury apartment with all of the interior walls removed. A wide walnut desk with a leather wing chair sat off to one side. At the far end, near a garage door, an old car sat under a gray cover, the fabric slightly wrinkled as if it had been disturbed. A well-used billiards table sat in the middle, the balls scattered across the lush green felt. In a dark corner to her left, a caged-off area held printing equipment. Could this be the source of the million dollars in counterfeit cash? She kept one eye on Prez and crept over to the equipment. The smells of ink and chemicals filled her nostrils. She drank in the sight of the ink-smudged printing press and the light table littered with scraps of black film.